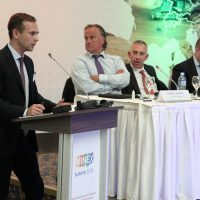 MINEX Europe offers excellent opportunities for the presentation of mining market reports, changes to legislation, and case studies of the implementation of technical and investment project; and for organising technical masterclasses, and even, attracting the participation of the audience in the discussion of the challenges and changes facing the mining sector of Bulgaria and the countries of Europe. Ministers, EU officials, Ambassadors and Heads of the Intergovernmental and International Organisations regularly present at the opening of MINEX Europe Forum. Plenary sessions are usually held in the morning part of the program and last from 60 to 90 minutes. Before the start of the sessions, we invite the audience to take part in polls via our tailored mobile app which allows us to project live answers on the main screen. Session topics should be of interest to the entire audience of the forum and, as a rule, include overviews of industry-wide issues, important changes, trends, as well as talks by the CEOs of leading mining and metallurgical companies. Presentation time is limited to 15-20 minutes. The program committee of the forum welcomes engaging talks which will stimulate the exchange of best practices and new ideas. Presentations proposed for plenary sessions should exclude advertising or marketing content. Theme: Investing in Eastern Europe and the Balkans – an investor’s perspective‎. Theme: European Mining Agenda – exploration challenges and the need for innovative technologies. Theme: Industrial Minerals within Europe – an Imerys perspective. The Forum offers global dissemination platform for raising investor awareness of the Mining and Exploration projects developed in the Balkans countries and across Europe. Examples of the presentations of Major and Junior mining companies at the previous Forums. “Rio Tinto lithium-borate Jadar project” – Richard Storrie, General Manager, Rio Sava Exploration d.o.o. Technical sessions are usually held in the afternoon and last from 60 to 90 minutes and include panel discussions. Before the start of the sessions, we invite the audience to take part in polls via our tailored mobile app which allows us to project live answers on the main screen. Technical sessions often include presentations of new technology case studies, trends in specific market segments, changes in the state regulation of subsoil use, financing or evaluation of projects, among others. The time for presentations is limited to 15-20 minutes. The program committee of the forum welcomes presentations of cases illustrating the introduction of innovative industry solutions and technologies at mining enterprises in Europe and Worldwide. Use of advertising or marketing content without reference to the practical implementation examples is not welcome. Thought-provoking panel discussions are held during plenary and technical sessions and as independent sessions. They offer opportunities to share thoughts and ideas via moderator-led dialogue on the range of themes e.g. regulation, investment, business practices, education, etc. Panel discussions last from 30 to 60 minutes. In addition to traditional presentations, speakers can present their views by answering questions in video interviews. An interview can be organised either on stage with the presence of live audience (as with TV debates) or in one-on-one private interview format. Both private and public interviews can be recorded on video and published on MINEX Forum YouTube channels in the open or restricted viewing formats.